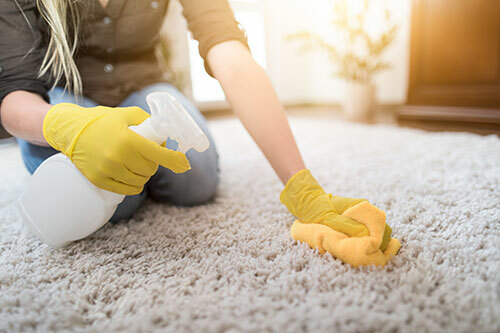 Carpet Cleaning can be a hassle but if you have kids and pets then you’ll likely being doing a lot of carpet cleaning throughout the life of your carpet. Professional carpet cleaners can be expensive and if your carpet is constantly getting spilled on and then you won’t be wanting to pay for someone to clean them all the time. There are many tips and tricks out there that will help you be able to save some money and make your carpet just as good. The biggest help is by taking preventive measures and then if something does happen, cleaning it the correct way. Regular vacuuming preserves the life of your carpet. The longer you go without vacuuming the more impacted your carpet becomes with dirt, hair, dust and the like. These unwanted friends in your carpet are magnets for spills and stains. The more you vacuum the more agitated your carpet is causing the dust and dirt to settle less on it. To keep these nasty things out of your carpet for when a spill does happen, take the time to vacuum your carpet at least 2 times a week. This will help to prevent stains from getting embedded into your carpet. Scotchgard is a preventative care that will help when spills happen. Scotchgard helps to protect your carpet from stains by forming a protective sealer. When applied it needs to be raked thoroughly into your carpet to disperse it all over and deep into the fibers. This protective layer prevents stains from becoming deep. It holds it at bay on a surface level for the stain to be easily cleaned up. This can be done once a year. When doing so make sure to follow all the instructions for the best results. Now that you have taken preventative measures for your carpet, when a stain does happen it’s time to clean. There are certain steps that will produce the best results. Make sure that you test the cleaner on a small piece of carpet first. Then when cleaning it be sure that you use the least amount of cleaner possible and follow the cleaner instructions. Different stains will call for different cleaners. Don’t think that the all-purpose stain cleaner will be the best for every stain. This means that you’ll have to research. No matter what cleaner you use, be sure not to scrub the carpet because it will unravel the carpet strands. Carpet cleaning can be tricky. It is possible to clean your carpet and keep it looking beautiful. The most effective way to keep stains out of your carpet is by taking preventative measures first. Then when a stain happens you’ll have half the battle already fought. Get your carpet looking clean, new, and beautiful today by Elite Carpet Cleaning and contact them for a quote! This entry was posted in Floor by realityco. Bookmark the permalink.